BUILDING OWNERS who find signs of termite activity inside a building have several options for professional protection from continued termite infestation and timber damage in the building. Initial Inspection & Report to A.S.3660 - a thorough inspection of buildings and surrounds - detailed written report to Australian Standard 3660 re areas inspected - evidence found of termite activity - high risk termite entry areas inaccessible to inspection - termite control options and limitations. Chemical Soil Treatment around the perimeter and sub-floor of a building - to eradicate termites attempting to gain entry into the building - Termidor or Premise termiticides are recommended. Termite Baiting - installation - monitoring of termite bait stations - Nemesis - Exterra - Sentricon termite baits - this method relies heavily on the termites "finding" and consuming sufficient bait - recommended in some limited circumstances, particularly in areas where live termite activity is present. Essential first step - obtain a professional Termite Inspection Report - a thorough inspection of the buildings and surrounds - a written inspection report and detailed specifications to A.S.3660 for an integrated termite control program. It is recommended the inspection and report be received and considered in detail before any protective measures are commenced. The inspection includes all accessible timbers within the crawl space in the sub-floor - roof void - interior - exterior area - garden landscaping - fences - other timber structures - trees in the locality. The cost of a professional Termite Inspection Report to A.S.3660 is approximately $200 to $300 - medium size residential building, depending upon style of construction and ease of inspection access. Home insurance does NOT cover damage to structural timbers caused by termites - some pest control companies carry professional indemnity insurance cover for complete soil barrier treatments to AS3660 - practicable in vast majority of building types and construction. Complete soil treatment to AS3660 - the soil at the base and perimeter of the subject building is treated with a long lasting termiticide - which kills the termites if they attempt to access the building - recommend Termidor or Premise termiticide be used due to their long term effectiveness and safety profile if used correctly - both Termidor and Premise termite control products exhibit a transfer effect - chemical taken back to central nest to eradicate termites therein - over time the complete eradication of the entire termite colony (discussed in detail later on this page). Termites in the building at the time of chemical soil treatment - they cannot safely return to their central colony nest through the termiticide in the soil. Termites are compelled to return every few days to their central colony nest in the ground to obtain moisture essential for their survival and to feed and groom the nymphs (young termites), the king, queen and other termites. Special care and equipment can be used to detect a subsidiary termite nest contained within the building structure. Subterranean termites may build such a nest in a roof or wall cavity where moisture is regularly supplied, say from a faulty plumbing, leaking shower recess, broken roof tiles and faulty guttering. There are several types of termite control chemicals registered by the relevant Australian Federal Government AVPMA for use in termite control as a soil treatment chemical. WARNING: Several outdated products are solvent based termite control pesticides which may cause health problems to asthmatics during the drying process. Termidor and Premise are the safer effective alternatives. Both are water based, have virtually no smell and of ultra-low hazard to humans, dogs, cats and other mammals. Termidor is manufactured by BASF, and Premise by Bayer Environmental Science - two of the worlds largest chemical companies. Premise has been used as soil treatment against subterranean termites for more than ten years in Australia and the USA with excellent results for long term termite control. We are not aware of any significant problems with the effectiveness of Premise termiticide during this period. Transfer effect - Termidor and Premise termiticide sticks to soft waxy skin of worker termites - some termites transfer the termiticide back to central nest - spread to other termites and the queen - mutual grooming and feeding habits - termites groom fungi and termiticide from each others skin - termites also regurgitate liquidized timber food and any termiticide digested during their tunneling in a termiticide treated zone - industry feedback indicates Termidor and Premise are highly effective termiticides. Cannibals by nature - termites carry away or cannibalize other dead termites - further spreading the lethal effect of the Premise or Termidor termiticides throughout the termite colony. We recommend Nemesis as the only AUSTRALIAN owned and developed product. Exterra and Sentricon are USA owned termite bait products. 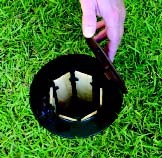 Each baiting system uses a number of plastic bait stations for in-ground and above-ground installation where active termites have been located. How a termite bait works: Each termite bait contains an IGR chemical - that is an insect growth regulator - the Nemesis bait contains chlorfluazuron as the active constituent. 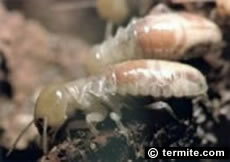 The worker termites readily eat the bait and pass it onto other termites in the central nest as part of their mutual feeding and grooming process. Termites must regularly molt in their development from nymph to adult. The IGR is slow acting - enough time to spread it's deady effect to other termites in the colony. Regular monitoring is required: The Nemesis, Exterra and Sentricon termite baiting systems are subject to regular inspection and monitoring by the termite controller. The larger the number of termites that consume the bait, the quicker and more certain is the termite colony elimination process. WARNING: some pest controllers offer termite baiting at ridiculously low prices that does not cover direct materials and labour. BEWARE the pest control licensing system is inadequate. Some individuals have a State Govt WorCover pest control licence with little training or experience. Ring the Experts: successful termite protection of a building using a baiting program often requires expert skill and judgment, based upon years of field-work experience in termite control in a wide variety of circumstances. CONSUMER NOTICE: Be wary of companies want full payment upfront that promise a timber replacement warranty using a termite baiting and monitoring system. Be careful to read the Contract fine print which stipulates that the so called "warranty" may or may NOT apply at some future point in time when the company decides at it's discretion that the termite colony elimination is successful. Your home is a much bigger bait station. Other termite nests may exist in trees, under concrete on-ground flooring and in-fill patios of neighboring properties. These termite nest may be unaffected by the baiting pro gram. If termites happen to 'find" the in-ground "monitoring" stations, the a bait is placed therein. If this involves sufficient disruption of the termites may avoid the in-ground bait station, entirely. RECOMMENDATION: Your Pest Controller attach the Nemesis Termite Bait directly onto known termite activity areas. The rate and amount of consumption is monitored for several weeks. In addition, if practicable thereafter, a complete chemical soil barrier treatment using Termidor or Premise be applied around the immediate perimeter of the building and other high risk entry points. High humidity, dampness or moisture accumulating in a wall cavity is of high risk to encouraging large scale termite activity inside the building. CONSUMER NOTE - the installation of a chemical soil barrier does not negate the need for regular competent inspections - at least 3 to 6 months where the termite risk is high. Recommend 3 or 6 monthly inspections be carried for the first 24 months following a chemical soil treatment - thereafter annual inspection is recommended to maintain your service warranty.